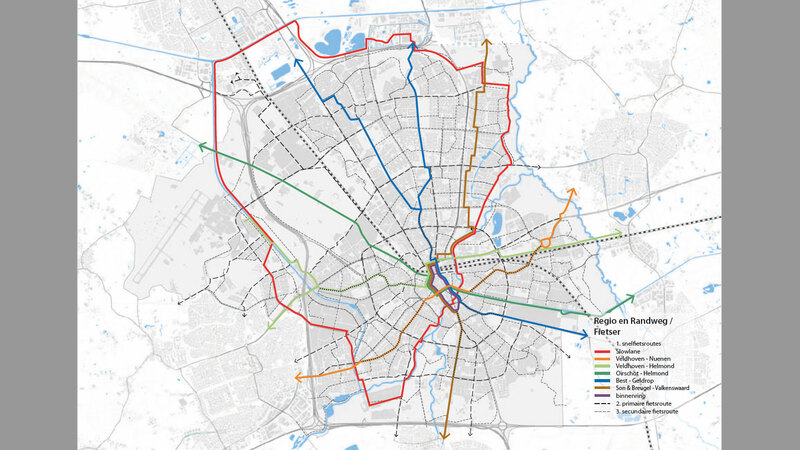 Eindhoven is creating a fast cycle route, a 32 kilometre long loop around and through the city, that is in its final stages of construction. The plans were first made public in 2011, construction has been going on ever since. Further works in the north were announced for 2019 and 2020. But all is not perfect on the Slowlane as this fast cycle route has been inaptly called. Eindhoven’s “Slowlane”, marked with a series of Ses as centre line at this location, runs past a parking lot of the University of Technology here. These signs, announcing the construction of the Slowlane can be found at regular intervals alongside the route. 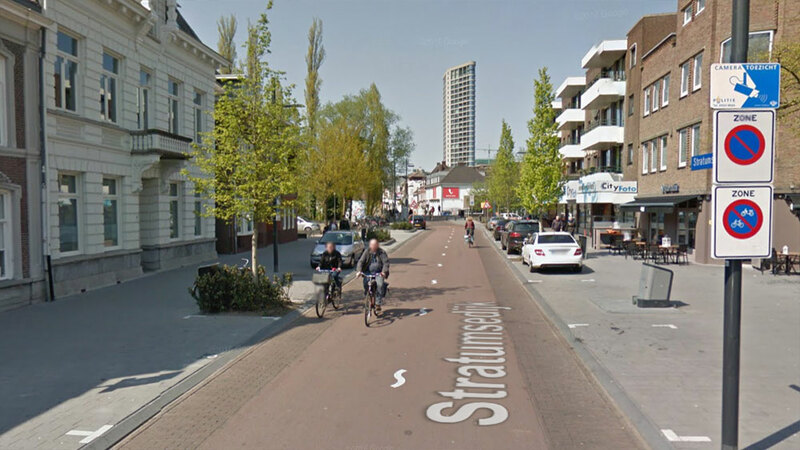 In 2011, Eindhoven, the fifth largest city in the Netherlands, proudly announced it would build a “Slowlane”. The Slowlane is a 32 kilometre long cycle route with the aim to connect the economic top-locations in the city in the fastest and most environmentally friendly way. Eindhoven tries to develop, foster and increase a knowledge economy. This high-tech environment is known in the Netherlands as a Brainport. Going past industrial hubs and large companies (and thus employers) like ASML, Eindhoven Airport, the Brainport Innovation Campus, the High Tech Campus, the University of Technology and Philips, the Slowlane offers employees a fast and comfortable route to their workplace. An alternative to the car routes – the fast lane – hence the name. That name was rightly criticised from the start. Apart from these economic locations the Slowlane also takes people through beautiful nature reserves, such as the valley of the river Dommel and areas with forests. 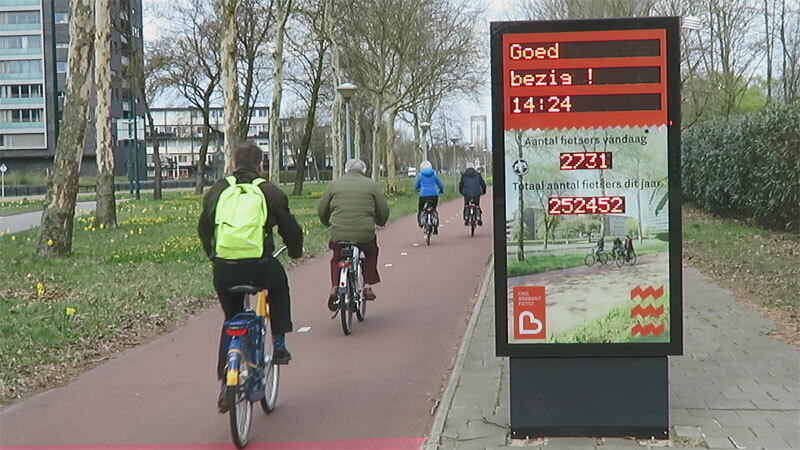 For the “Brainport Avenue” development program, that this cycle route is part of, the national government donated 65 million euros. 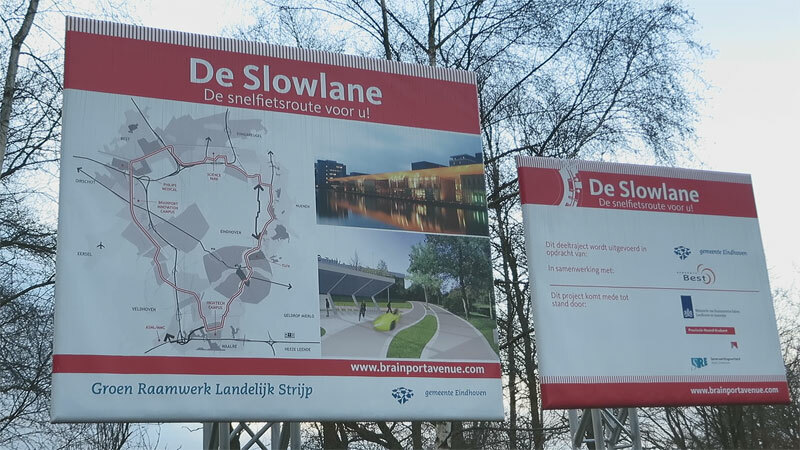 The Slowlane runs through four different municipalities; Eindhoven, Best, Son & Breugel and Veldhoven. To a large extent the route was projected on existing roads and cycle paths, even the well-known Hovenring is part of the Slowlane, but at some locations there was no infrastructure at all so far. The Slowlane connects many of the green areas and river valleys around Eindhoven. There were elaborate plans for the Slowlane in the original publications about it in 2011. I have not seen these logo’s on the surface so far though. I did see a velomobile using it. You can see it in the video. The first building activities started in 2012. I sometimes tweeted about it. 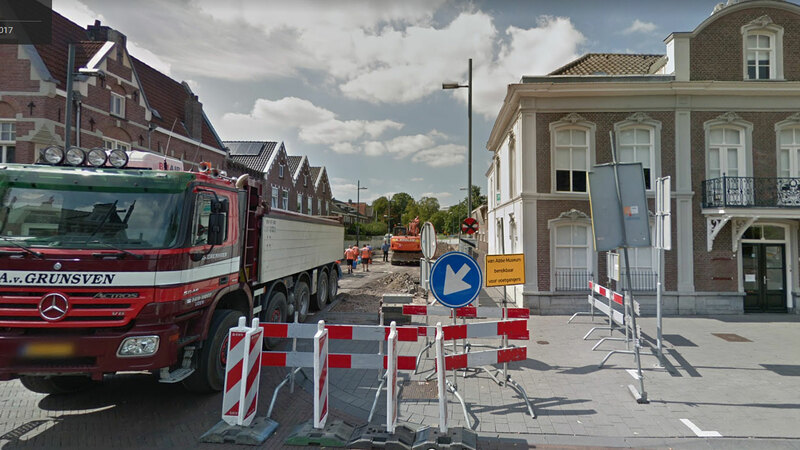 For instance when I cycled past the building site on my way to the Eindhoven airport to catch a flight to Budapest where I was to give a presentation. In 2014, I portrayed Eindhoven as a nominee for Best Cycling City of the Netherlands. I then encountered a sign informing the public about the Slowlane. That part of the cycle route, in the more rural north-west, was the first to be completed. It was there that in 2015 the official opening took place. Since the city focuses so much on offering a cycle route for workers in the knowledge economy the local press called it a “cycle path for smarty-pants”. This counter in the city centre counted 3,717 people cycling that day and 388,870 for the year so far. This shot was taken on 27th March at 3:15pm. “Good that you cycle!” is what the top line means. The cycle route has priority on most of the crossings with motor traffic. That works fine most of the time, but sadly not always. Of the total 32 kilometre-long loop about 4 kilometres passes through the city centre inside the ring road. Both crossings with that ring-road are in underpasses. The city centre part of the Slowlane was finalised from about 2016 to 2018. For this post I decided to cycle from the High-Tech campus in the South to the Máxima Hospital in the North, which is about 5 kilometres. This part too was meant to be as conflict free as possible. Many older underpasses were included in the route. Sometimes they were upgraded, like the so-called “Silly Walks Tunnel” under the railroad tracks near the station of Eindhoven that I showed you earlier. 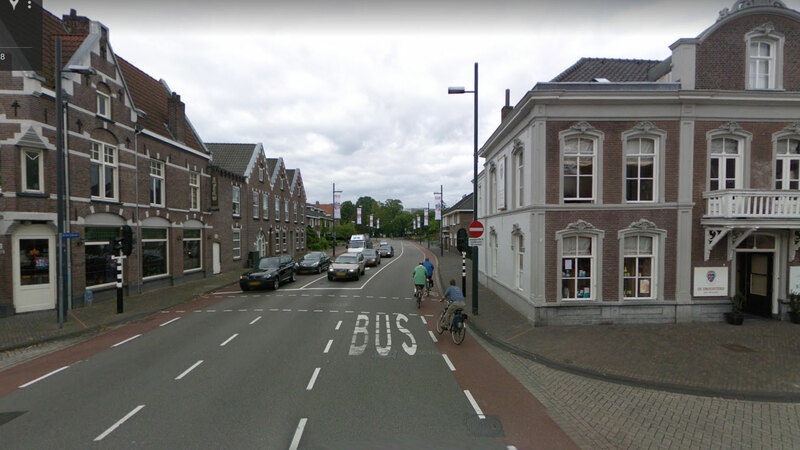 To make the Slowlane distinguishable as a separate route and not part of existing streets, some of the streets that had one-way on-street cycle lanes were completely redesigned into a bi-directional cycle way separate from the roadway for other traffic. 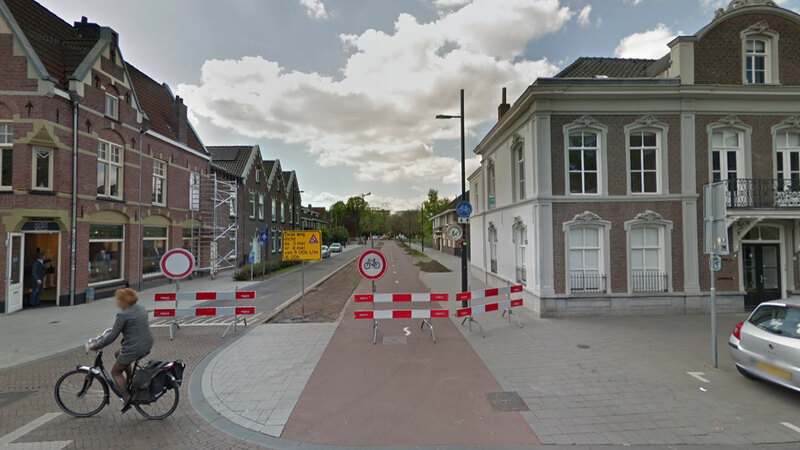 That roadway was often narrowed, sometimes even made one-way for motor traffic to create more space for cycling. Two-way cycle routes are often more comfortable to cycle on and they make the route more identifiable, but there are also disadvantages, especially where the route crosses other types of traffic. 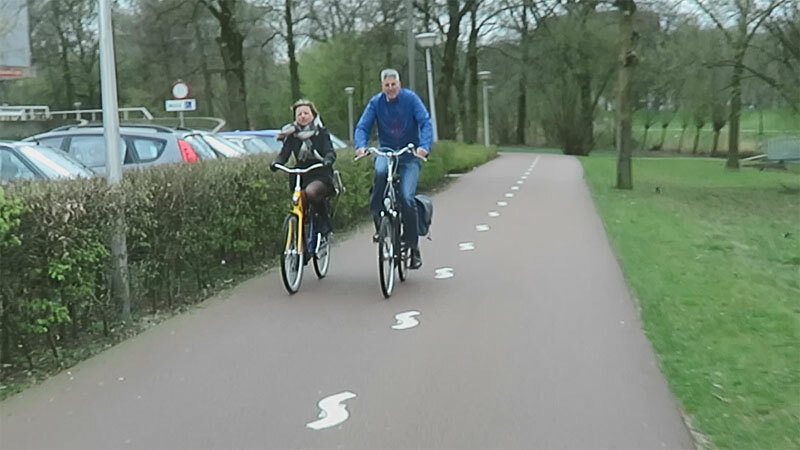 Initially the city wanted to make the route different from other cycle routes and it therefore tried different colours for the surface; gray and a yellow sand-colour. The Cyclists’ Union insisted that the city would use red, the common colour for cycleways and fortunately most of the route is now red. The desired width of 2×2 metres for each direction was often achieved. Only in narrower streets in the centre, where older cycle paths were used, they seem to be somewhat narrower. At one location in the city centre a cycle street was installed. Eindhoven, often referred to as a “car-city”, is one of the few Dutch cities that still have an inner-city ring road; a gyratory system (a one way ring) in the city centre. Where the Slowlane crosses that inner-city ring road the protected signalised intersections were reconstructed and the new bi-directional cycleway now got priority over the ring-road. The crossing of Wal/Bilderdijklaan was reconstructed in 2017. The traffic lights were removed and replaced by stop signs for motor traffic and even flashing warning lights. All that was not enough to warn drivers of this new reality. They kept expecting to have priority and this led to some crashes on that location. One, in January 2018, resulting in the tragic death of a cycling 58-year-old woman who was hit by a car whose driver failed to give her priority. After this fatality the city quickly acted – urged by the local chapter of the Cyclists’ Union, amongst others – to improve the safety at this location. The intersection got bigger speed bumps first, forcing drivers to slow down, but when even that did not suffice to make it safer the traffic lights were re-installed. If you can’t break the habits of drivers that is sometimes seen as the only way to make a specific intersection safer. Because of this incident and some others on the Slowlane in the city the safety of the route was investigated. The outcome of this investigation was that although some other incidents were reported they did not require further redesigns. 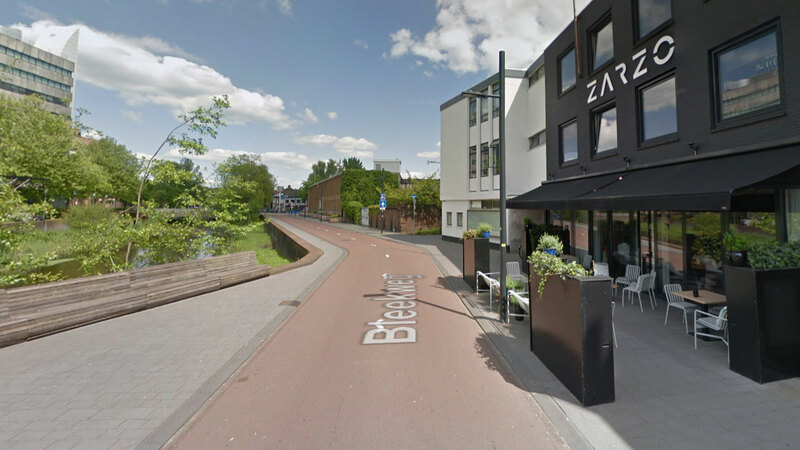 It may seem strange that Eindhoven chose to build such a high-brow single cycle route in the city. 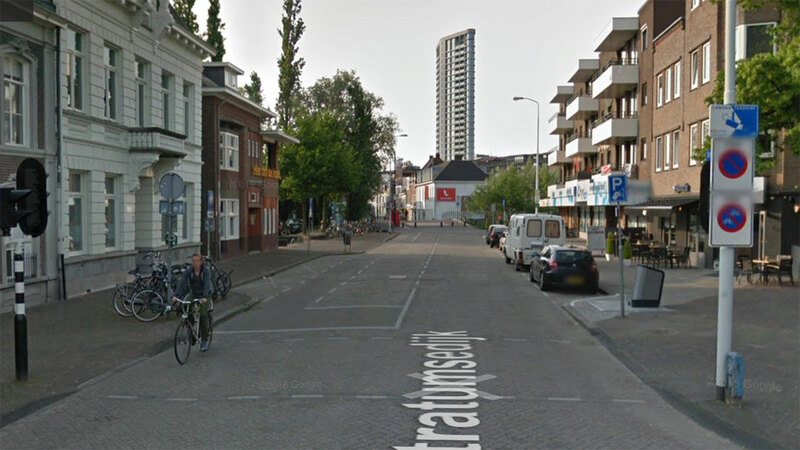 Hadn’t the 1970s experiments in Tilburg and The Hague shown that one route in a city is not the way forward? 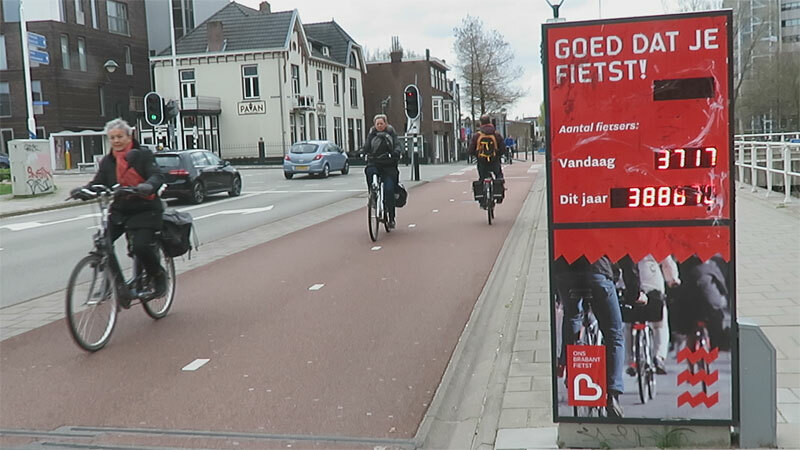 Yes, that is true, but the Slowlane is not the only cycle route in Eindhoven. It is the backbone of a cycle network. That the rest of the network has a comparable quality to this one makes it harder to distinguish the Slowlane. In the initial plans the route would stand out in extra width, colour and signage. That has not been realised. Now that the route became red like the rest and the signage was not (yet?) placed, it is really hard to find out what part is the Slowlane exactly. Only at some locations the centre line is in the shape of an S (S for Slowlane) but then the full route is also not finished yet. For 2019 new works have been announced. 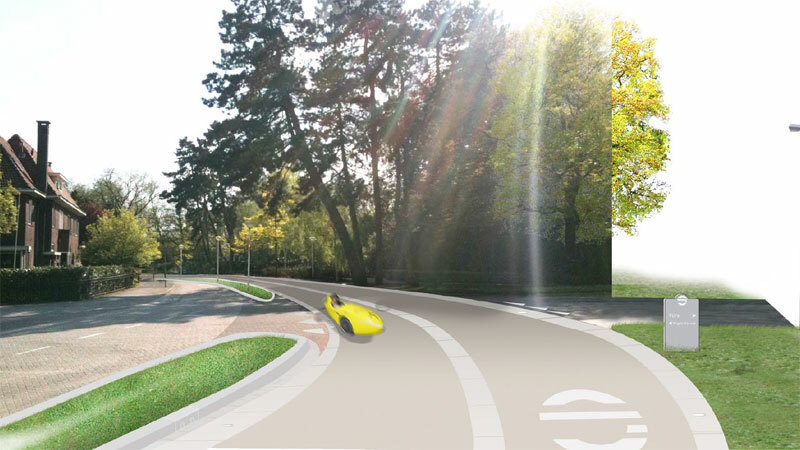 In the municipality of Son & Breugel, north-east of Eindhoven, a new part of the route will be constructed. 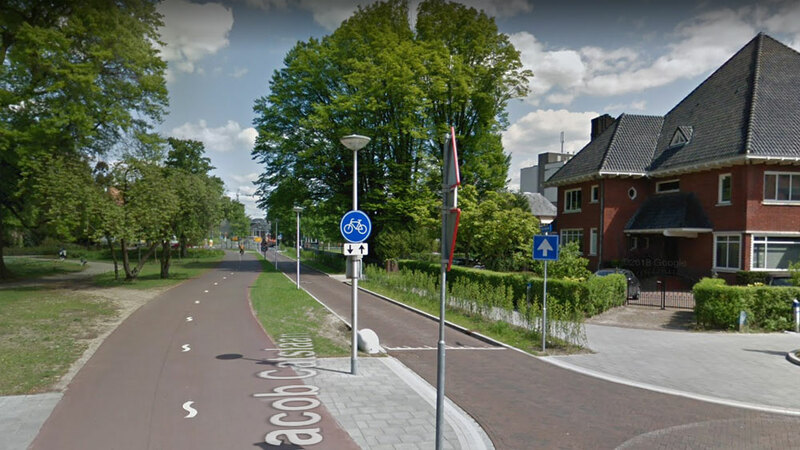 That municipality and Eindhoven were able to get a subsidy from the national government to build this part of the projected Slowlane and a cycle route leading to it. 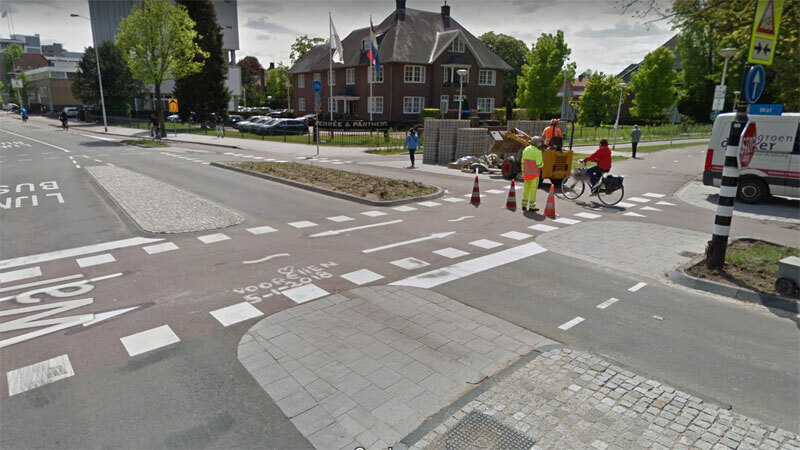 The smaller municipality stresses that they see this as an upgrade for the many school children and adolescents cycling to school and studies in Eindhoven. That seems to be less directly related to the brainport project, but we should perhaps see these children as the “smarty-pants” of the future. The entire Slowlane is not finished yet. In my Google map (below) I tweaked the route a little (in the north) so you could cycle it today already. I will keep following the further developments and construction of the Eindhoven Slowlane. 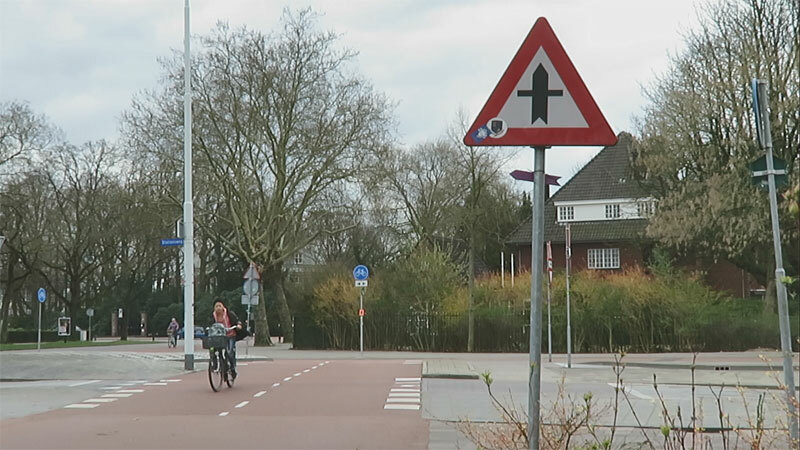 The circular Slolwlane in red stands out in the cycle network of Eindhoven, but it certainly isn’t the only cycle infrastructure the city has to offer. There is an elaborate network with a fine mesh width. Note the smaller circular ring road in the bottom right with the oval(ish) inner-ring road inside, which is the centre of Eindhoven. Map of the entire route in purple and the ride I made in green. (South to North) in 360 degrees. Nice touch, the ‘Bicycle Dutch’ logo on the 3D black hole! 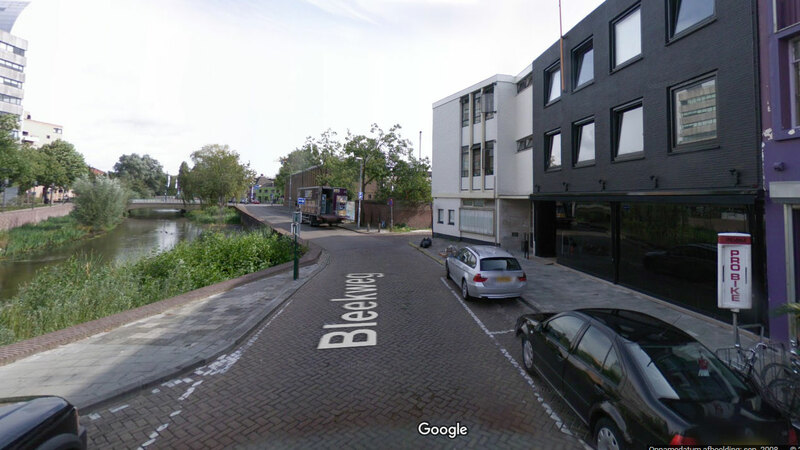 What happened to the bus lane on the Bilderdijkstraat? There no longer seems to be a bus route in that street. So the bus lane was not needed anymore. 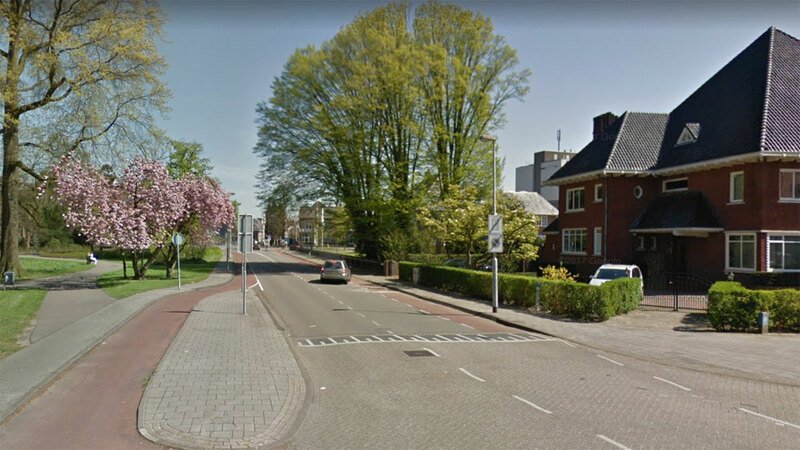 This entry was posted on 10 April 2019 by Bicycle Dutch in Original posts and tagged 360-ride, Eindhoven, exceptional cycling infrastructure, long distance cycle paths.